The Truce and Peace of God was an effort or movement by the Roman Catholic Church that applied spiritual sanctions to limit the violence of private war in feudal society. The year 1000 was a fundamental turning point in European history. The feudal system as it had evolved since the Carolingian dynasty was undergoing change because of economic, political, and religious factors. European leaders began to cultivate imperial endeavors and were competing for natural resources and labor in order to expand their markets and acquire territories. The Truce of God was the solution to the problem of military groups taking the law into their own hands, prosecuting their own disputes without recognizing any authority, and confiscating lands. Prior to the development of the Truce of God, nobles became more powerful and contested monarchical authority, especially in France. Villagers became victims of incessant warfare, and they were subjected to the claimed authority of military lords who promised to defend the weak in return for the fruits and produce of servile labor. People turned to religious authorities for protection. The Truce of God was therefore a political and religious response to the competitiveness of feudal society. On the religious plane, the truce was a large peace movement spiritually connected to the millennial anniversary of Christ’s life on Earth. The primary goal of the Truce of God was to protect church lands and rights. 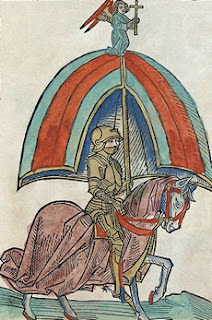 Church and municipal organizations cooperated to deal with violence and used religious and spiritual techniques to counter the aggression of armed knights. Churchmen were particularly interested in defending their properties because they were the largest landowners in medieval society. While the Truce of God was a temporary suspension of hostilities, the Peace of God was considered perpetual. The Peace of God included only the clergy but eventually incorporated the poor, pilgrims, and crusaders. Although the Peace of God developed to include the laity (when they suspended judicial and military disputes), spiritual leaders expanded the Peace of God platform to establish sharp distinctions between the laity and the clergy, between the sacred and the secular. As the clerical establishment set limits to internal Christian warfare and sanctiﬁ ed violence against the enemies of Europe, in particular Muslims, the Peace of God spread from France to the German empire. Warfare against the enemies of God and the enforcement of the division between spiritual and physical authority were both concepts and agendas that united diverse Christian societies in Europe. The popularity of the Truce of God was in part due to ancient devotions and the cult of the saints. Tradition supported new ideas and practices. Bishops and monks relied on saints and the relics of the saints to defend themselves. Churchmen convoked peace councils in order to convince warrior elites to take up the cross and oaths of peace. Churchmen reminded their flocks of the great martyrs and saints who endured torture and loss of property in return for divine favor. The memory of the sacrifices of the saints and martyrs inspired Christians to make sacrifices such as the cessation of hostilities. 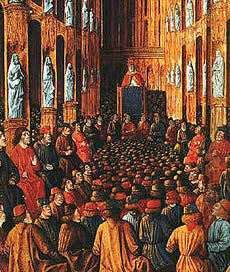 These peace councils were first held in Aquitaine and Burgundy. In 975 Bishop Guy Le Puy called upon his community to protect the church from pillagers. Clerics across France formulated peace canons, and territorial princes formed peace movements centered on the cult of local saints and shrines containing relics. Prelates organized peace militia that protected monastic holdings and persecuted heretical groups. At the Synod of Arles in 1041, clerics, especially Cluniac monks, banned the shedding of Christian blood and suggested that Christians could not fight other Christians from Thursday to Monday morning (in commemoration of Christ’s passion), and important feast days such as Lent. Christian leaders encouraged military elites to divert their aggression toward the non-Christian, thus preparing a crusading spirit, which would manifest itself in the First Crusade in 1095. In 1095 Pope Urban II authorized the war against Muslims in the Holy Land on the basis that God would approve such noble efforts. Church leaders also encouraged powerful lords to centralize their government, redirecting the military power of the knights against the infidel. The most powerful lords were the kings, who by the 12th century began to enforce their own programs of national peace, monopolizing violence against infidels and heretics. The struggle for power among the nobility resulted in new feudal relationships as new families came to prominence. Noble families fortified their holdings by establishing primogeniture. With the consolidation of principalities and kingdoms and the stabilization of society by means of the implementation of the Peace and Truce of God, Europe became imperialistic and developed colonial projects. The European economy expanded because of higher agricultural yields, commercial development, demographic growth, the establishment of universities, and the implementation of reform programs that converged with the rise of the papal monarchy, the enforcement of disciplinary mechanisms, and the execution of policies of conquest.